With societies constant need to organise, review, rate and generally control everything, there is a new area for it to invade: Love. There are the serial daters, ones who have so many dates wedged into their busy social calendar that they don’t have time to think about how the dates actually made them feel before rolling onto the next one. 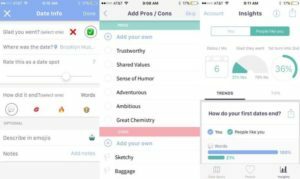 That is why the incredible (note the sarcasm) App has come onto the scene; dubbed as a ‘dating and relationship manager’ it will allow you to finish your date and then rate the overall experience. If that doesn’t send chills up your spine, lets move on to details. The overall review consists of a 1-10 score for the experience, with handy room to add notes about an post-date activities that may have occurred. You can then drop in a rating for the location as a dating spot, so that others can learn everything they need to know about a location before taking a date there themselves. Rating places isn’t knew, there are a thousand ways to find out if a restaurant makes good food, but looking for a rating specifically for a date seems to take away some of the magic from going through the experience together if you have already worked out the amount of steps from the table to the door. Now for the really good (heavier sarcasm) stuff. You can also add notes about your potential life partner on the app! Were they funny and polite? or were the damaged and carried baggage? Now you can out them on an App for everyone to see and really add to their anxiety levels (which someone can then rate on the App at a later date). Apparently, the deeper learning here is the ability to notice your patterns and reflect on your dating life. But bettering yourself definitely feels like an afterthought if you are seriously using this App to publicly rate people. 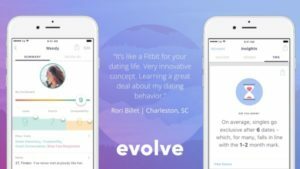 I mean come on, it is literally an episode of Black Mirror and investors gave Evolve $1M to make this horror story a reality. I think my sentiment is pretty clear on Evolve as a life tool, but I have faith in humanity that this won’t take off to widespread levels. But just to clarify, if you enjoy the company of other people and are actually looking for someone to be your partner and raise a child with etc, please don’t start the relationship by rating them for the world to see. ← Keep up to date with us!